Kansas City, MO. June 12, 2018– Wendell Castle: Shifting Vocabularies, an exhibition of the latest and last works created by Castle, will be shown at The Nelson-Atkins Museum of Art in Kansas City beginning June 23. 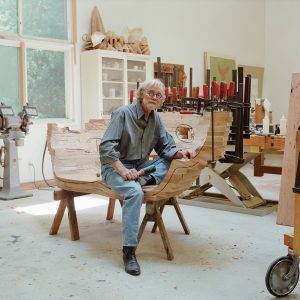 Castle, hailed as the most important postwar American furniture designer, died in January at the age of 85. Wendell Castle: Shifting Vocabularies includes five large works in the Bloch Building and four on the lawn of the Donald J. Hall Sculpture Park. Castle, whose first work in an exhibition was shown at the Nelson-Atkins in 1960, considered form and function equally, defying categorization by generating creations that skirted the boundaries of both art and furniture. His work, intentionally enigmatic, could be a chair from one perspective and a sculpture from another. Castle published 10 Adopted Rules of Thumb in 1996, which served as creative advice both for him and other artists. The list included “If you are in love with an idea, you are no judge of its beauty or value,” “The dog that stays on the porch will find no bones,” and “If you hit the bullseye every time, the target is too near.” He rarely let his imagination, or technology, stop him. Wendell Castle: Shifting Vocabularies closes Jan. 20, 2019.